Prawolf is a professional manufacturer of commercial vehicles' clutch and releaser. Using strict quality control and advanced management system, with all materials controlled to maintain high quality, every product is produced and tested following the superior standards of the original manufacturers. Each new product is developed according to Sachs original sample and all the key parts like clutch facing, diaphragm is purchased from Sachs and Valeo's supplier in China. And we are the only one to use laser wielding like Sachs in China. Now our products have been exported to European customers for many years on a large scale. Professional manufacturer of clutch and releaser for European commercial vehicles, like DAF, MAN, MERCEDES BENZ, IVECO, RENAULT, SCANIA and VOLVO. 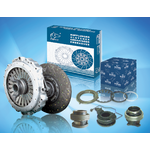 Our clutch facing and diaphragm are purchased from Sachs and Valeo's suppliers in China. And laser welding are only used in China to keep our clutch much more stronger and smoother. We are looking for big distributor and truck manufactuer company.